WASHINGTON, D.C. -- The majority of Americans say protection of the environment should be a priority, even at the risk of curbing economic growth, and believe the U.S. government is not doing enough to protect the environment. About three-quarters support spending more government money on solar and wind power, and support higher emissions and pollution standards for industry. Sixty-two percent of Americans currently say the government is doing too little to protect the environment, the highest in 12 years and well above the low point of 46% measured in 2010. The only time when the "too little" percentage was higher than 62% came in 1992, when Gallup first asked the question. Americans' view that the government is doing too little to protect the environment dipped after 2008, most likely reflecting the impact of the Great Recession -- which elevated economic concerns above environmental ones -- and the Barack Obama presidency, which generally pursued a pro-environment agenda. There has been a resurgence of interest in the government doing more on the environment over the past three years, most likely reflecting diminished concerns about the economy and a Republican presidential administration that is demonstrably less concerned with environmental protection. Relatively few Americans over the years have said the government is doing too much to protect the environment, with a high of 17% in 2012 and 2014. 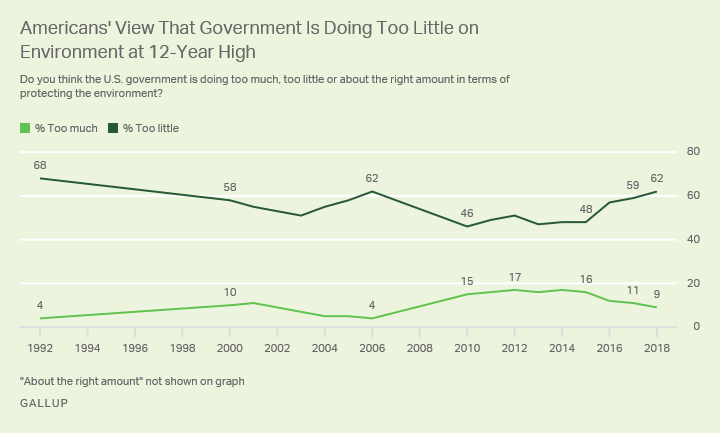 Over the past three years, as the percentage saying "too little" has risen, Americans have become slightly less likely to say the government is doing too much (now at 9%) and that government efforts are about right -- currently at 28%, down from 34% in 2015. 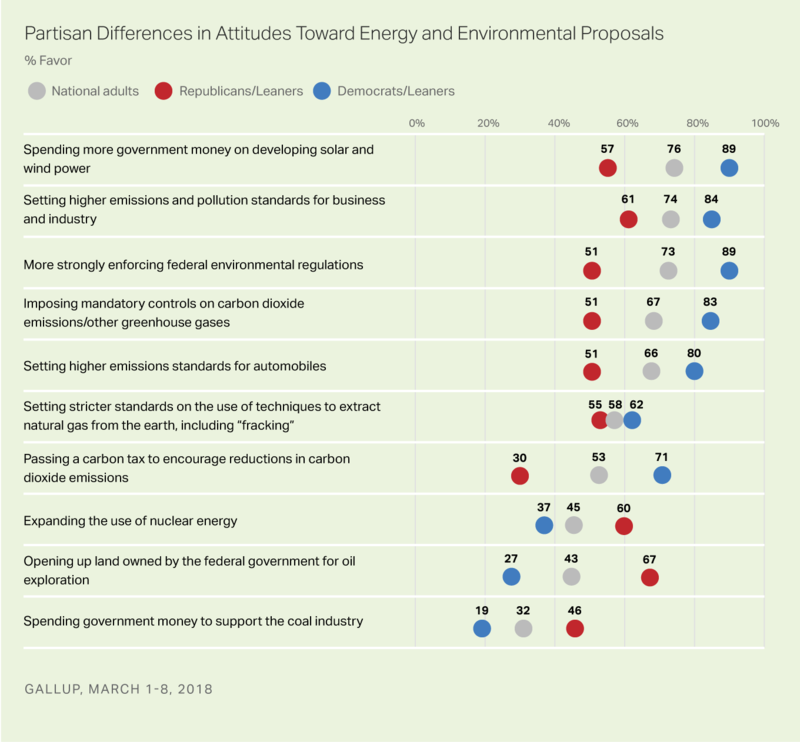 There are predictable and substantial differences in how Republicans and Democrats view government efforts on the environment. Eighty-five percent of Democrats and Democratic-leaning independents say the government is doing too little, compared with 31% of Republicans and Republican-leaning independents. By contrast, just over two-thirds of Republicans say actions of the government on the environment are about right or say it is doing too much. 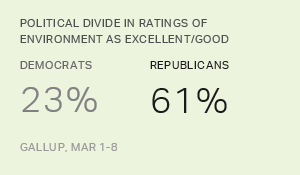 These partisan differences have been generally consistent over time. 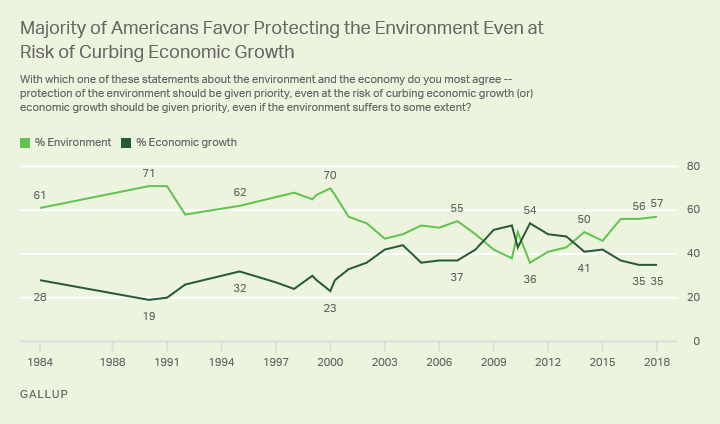 Gallup first asked Americans a trade-off question about the environment and the economy in 1984 -- with the choice between giving priority to the environment "even at the risk of curbing economic growth" or giving priority to economic growth "even if the environment suffers to some extent." Between 1984 and 2000, Americans solidly prioritized the environment. The gap between the two approaches narrowed thereafter. In all but one survey conducted between 2009 and 2013, during the recovery from the Great Recession, Americans favored the economic growth option. Since 2014, with a recovering economy, the environmental priority option has received more support than the economic growth option in each year's March survey. Between 2015 and today, the gap between the two has expanded. This year, 57% of Americans would prioritize the environment and just 35% economic growth. Still, the preference for the environment at the cost of curbing economic growth is not as large as it was in previous decades, perhaps reflecting the increasing political polarization of the issue. This year, 59% of Republicans favor the economic growth option, while 76% of Democrats favor giving the environment the priority. The difference in priority between the two partisan groups is generally consistent with the historical pattern in recent years. The March survey measured public support for 10 proposals relating to the environment and energy. Proposals to reduce emissions, enforce environmental regulations, regulate fracking, spend government money on alternative energy sources and pass a carbon tax all receive majority approval -- in some instances above 70%. The three proposals favored by less than a majority of Americans focus on more traditional energy solutions -- nuclear power expansion, opening up government lands for more oil exploration and providing more government support for the coal industry. Democrats are more likely than Republicans to support proposals dealing with controlling emissions and developing alternative energy sources, while Republicans are more likely to support those focused on traditional energy. 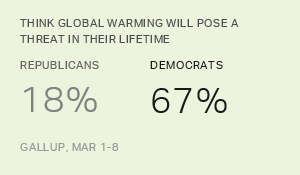 But at least a slim majority of Republicans favor six of the proposals dealing with curbing emissions, enforcing environmental regulations and investing in alternative fuel sources, even though at much lower levels than is the case for Democrats. Democrats and Republicans come close to agreement on one proposal: setting stricter standards for extracting natural gas through "fracking" operations. Sixty percent or more of Republicans support nuclear energy expansion and opening up federal lands to oil exploration, actions that receive much less than majority support among Democrats. Slightly less than half of Republicans support spending government money to support the coal industry -- one of President Donald Trump's signature proposals -- making it one of only two proposals that less than a majority of Republicans favor. The other is the idea of passing a carbon tax, which receives the lowest support of any proposal on the list among Republicans, most likely reflecting their apparent aversion to the idea of any type of new tax. Some of these measures have been tracked over time, and Americans' support for reducing and controlling emissions, enforcing regulations, and funding solar and wind development are slightly higher now than in the past several years but still lower than levels measured before 2008. Support for opening up federal lands for oil exploration remains significantly lower than in 2014 (58%) and 2012 (65%), when the measure was first included in the list. Americans are generally less positive about the quality of the environment than they have been in years, and are convinced that it is getting worse rather than better. 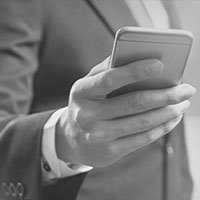 Gallup's annual March Environment survey provides important insights into what the people of the country want to be done to reverse that course. The Trump administration has over the course of its first 14 months in office announced that the U.S. will not participate in the Paris climate accord; rolled back government efforts to protect the environment; and advanced efforts to support traditional, fossil fuel energy sources. These policy actions appear to be contrary to the general trends in U.S. public opinion, which support more, rather than less, government action to protect the environment and favor efforts to develop solar, wind and other alternative fuel sources. The president and his appointees may argue that their main focus is on the base of voters who put Trump in office, and clearly his environmental approach receives more support from Republicans than from the general population. Most tellingly, Republicans agree with the general Trump position that economic growth should be prioritized, even if it risks harming the environment. Even with that, however, less than half of Trump's Republican base supports giving government money to support the coal industry, and slim or larger majorities say they favor a number of proposals to reduce emissions and develop alternative energy sources. This suggests that the president and Republican lawmakers and candidates could well find a nuanced position that coincides with the overall environmentalist sentiment of the American population without alienating their voting base.